First, clean the meat and cut into small pieces. Cut the meat until smooth. Cut tofu into small quarter pieces. Heat 2 tablespoon of oil, add the meat, and cook in a few minutes. Then add tofu and mushroom, add some water, add salt and sugar to taste. Add 3 tablespoon of maizena and cook in a few minutes. 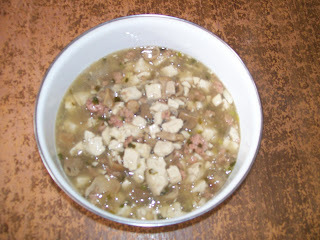 Soft Tofu and mushroom is ready to serve.